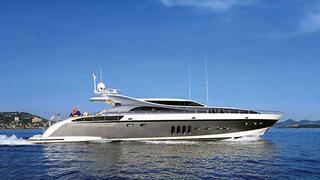 The 34 metre motor yacht Touchstone is sold with Vesa Kaukonen at KK Superyachts representing both buyer and seller. Touchstone was built by the Italian yard Arno and delivered in 2006 as the flagship of the yard’s Leopard range of yachts, featuring a large opening sunroof and modern interior. Powered by three MTU 16V 2000 M93 engines, each generating 2,500hp, she powers her guests to their destinations at an exhilarating 45 knots, while providing wonderful comfort and luxury along the way. She has large seating and sunbathing areas forward on the bow and on the aft deck, making her a fantastic, stylish and comfortable open style superyacht. The master suite, VIP suite, one double cabin with a Pullman berth along with one twin cabin with a Pullman berth provide comfortable accommodation for up to 10 guests and all cabins have en suite bathroom facilities. In addition, the main deck television lounge with adjoining bathroom can be easily converted into a fifth cabin. Touchstone was asking €2.95 million with VAT paid.